Outlook timesheet system turns Outlook appointments into timesheets! 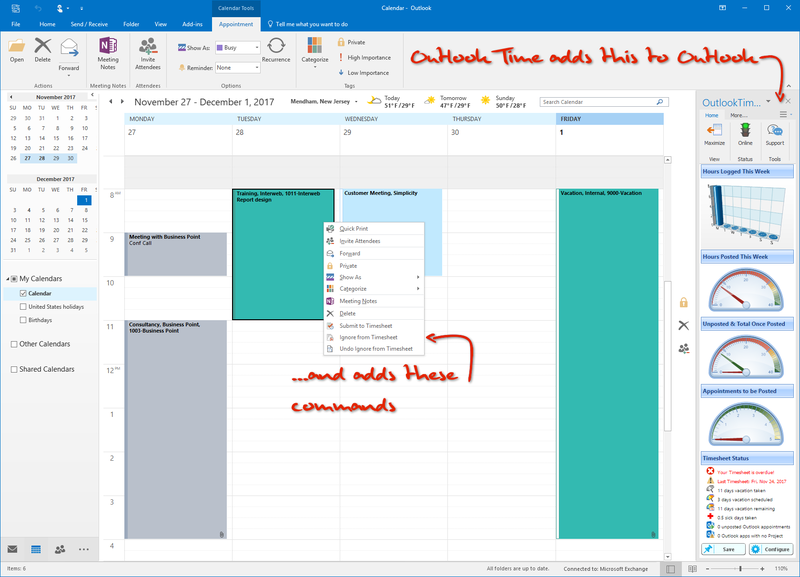 OutlookTime doesn’t change the way you use Outlook. It adds functionality, including this dashboard, to turn Outlook into a timesheet system. The OutlookTime dashboard shows employees the status of their timesheet – hours posted, appointments available to post etc. The Dashboard is configurable, users choose the information they see and the order of the charts & gauges. OutlookTime adds these functions to post an appointment as a timesheet, ignore an item, and undo an ignore. OutlookTime can color appointments to show which ones have customer/project information allocated and are ready to post to the timesheet. Grey appointments indicate ones that have already been posted to the timesheet. OutlookTime supports the use of categories, which can save users hours each week. With OutlookTime you can turn Outlook appointments into timesheets and Outlook into a time tracking system. 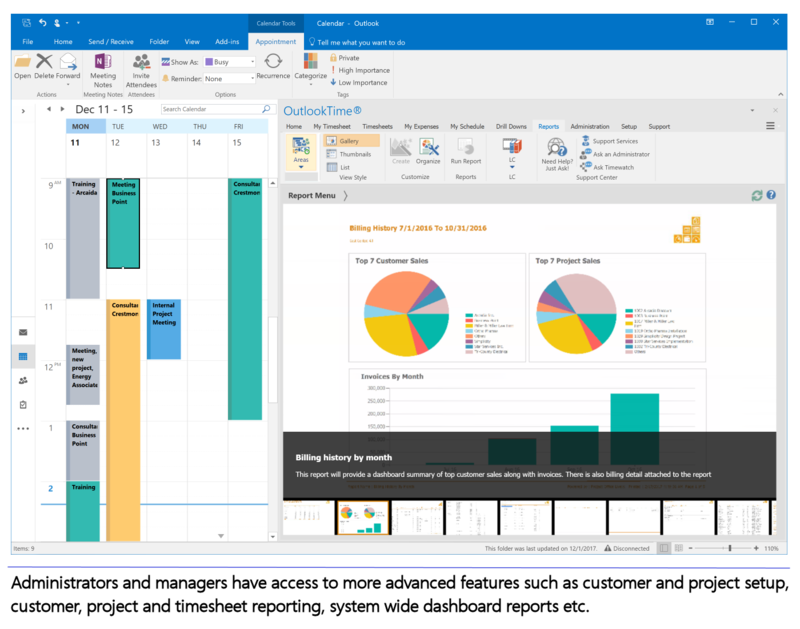 OutlookTime works with Office 365, making Outlook an office365 timesheet system and office 365 timesheet system. 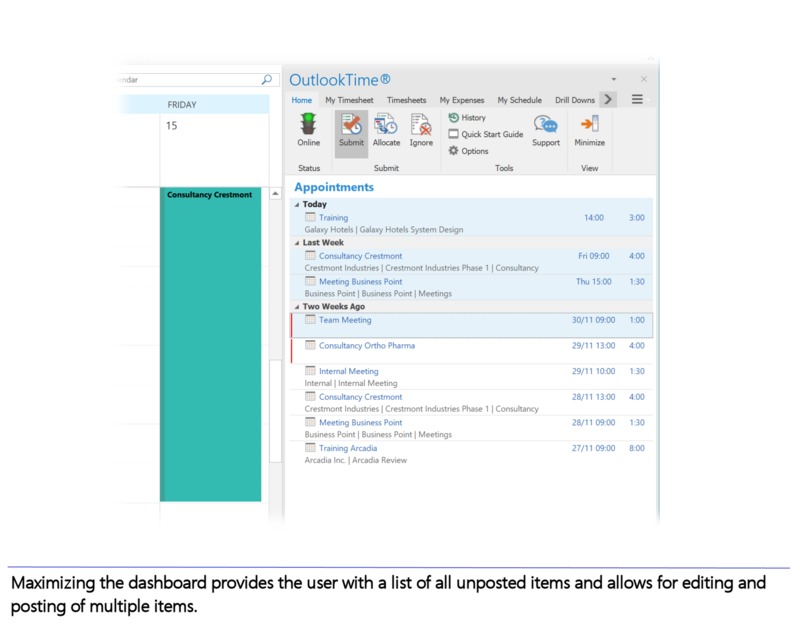 OutlookTime® is a dream come true for Outlook users, turning appointments and emails into timesheets, and Outlook into a timesheet system. 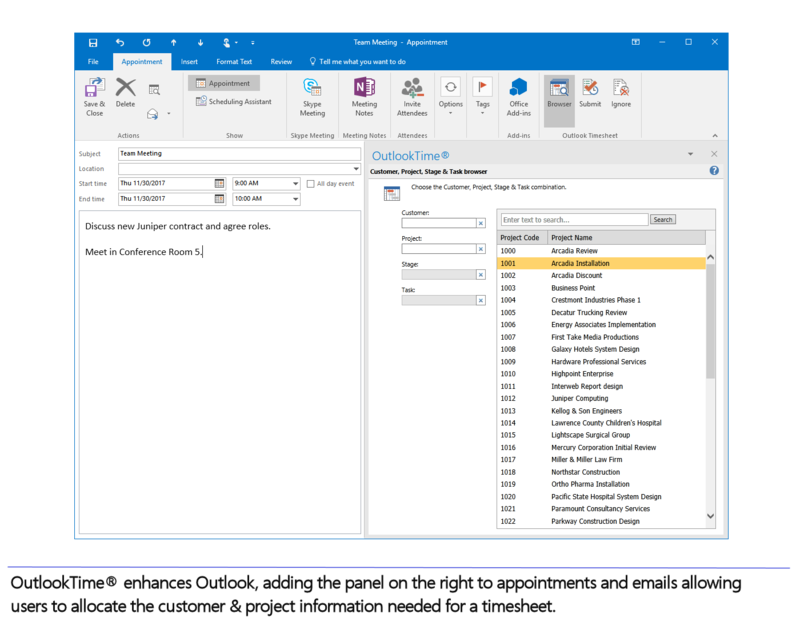 OutlookTime® doesn’t change the way you use Outlook, it enhances Outlook, allowing users to allocate customers/projects to appointments, and then post them to their timesheet. It really is that simple and that easy! If your organization uses Outlook and enters timesheets, OutlookTime® will increase timesheet accuracy, provide powerful consolidated timesheet reporting, and best of all, save each employee 1-2 days a month when compared to a traditional timesheet. If your organization uses Outlook and tracks timesheets, each employee could save 1-2 days a month with OutlookTime®. 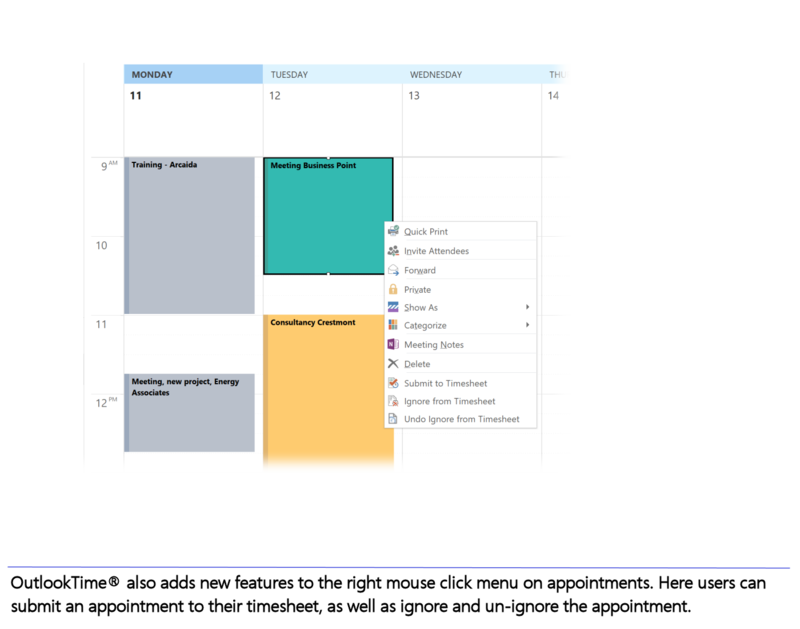 Outlook appointments and emails already hold most of the information needed for a timesheet, OutlookTime® enhances Outlook and adds timesheet functionality, allowing users to post appointments and emails to their timesheet. It’s simple, easy, and effortless. Stop duplicating data entry in a traditional timesheet. Contact us today to see how OutlookTime® can employees and administrators time, improve timesheet accuracy reporting and free up valuable employee time so they can work on more productive tasks. And if you have a traditional timesheet system that cannot be moved, contact us about integrating OutlookTime® with your system. OutlookTime® saves time wasted entering timesheets and instead uses data already in Outlook to turn appointments into timesheets. Utilizing data already in Outlook saves each employee around 1-2 hours each week, time that can be better utilized on productive tasks. OutlookTime® also saves Administrators time by automatically collating timesheet data for reporting. OutlookTime® is a sophisticated tool that supports implementations from around 5 employees to 5000 employees. Contact us today to see how OutlookTime® can save time, improve timesheet reporting and increase employee productive hours by 5% or more. Yes, I’d like to learn more about the Outlook timesheet. 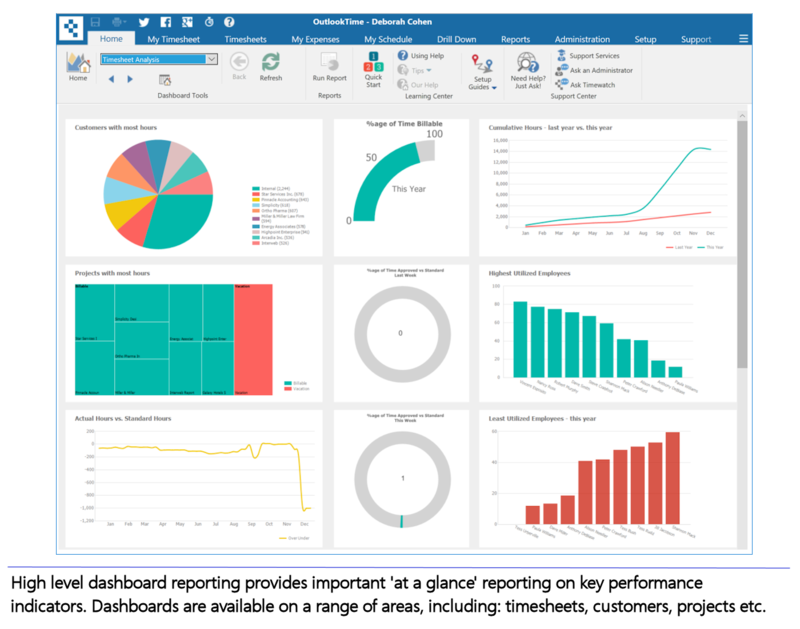 Outlook appointments have most of the data needed for a timesheet, but Outlook lacks the central customer & project data, timesheet management and reporting facilities required of a timesheet solution. OutlookTime® solves this by combining an Outlook App with a powerful timesheet server designed for Office 365 & Exchange. The Outlook App enhances Outlook, embedding powerful timesheet functionality within Outlook itself. 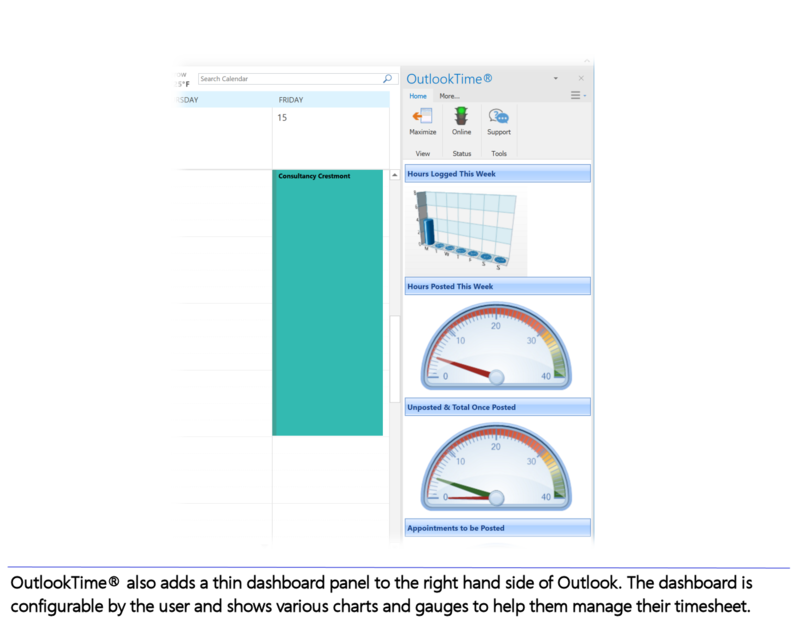 Imagine end users, administrators and managers being able to perform all of the functions of a sophisticated timesheet system from within Outlook itself – that’s OutlookTime®. OutlookTime® not only makes timesheet entry easier, analyzing timesheet data is easy too. Timesheets are consolidated from all OutlookTime® users which administrators and managers can access through a variety of reporting tools. All editions include a library of standard reports which can be viewed, printed, or exported to Excel, PDF, email or a financial system. Advanced editions also include our unique, interactive drill down reporting tools, automated alerts (such as late or missing timesheets) and dashboard reports. Custom reporting options are also available to allow you to perfectly match your reporting needs. 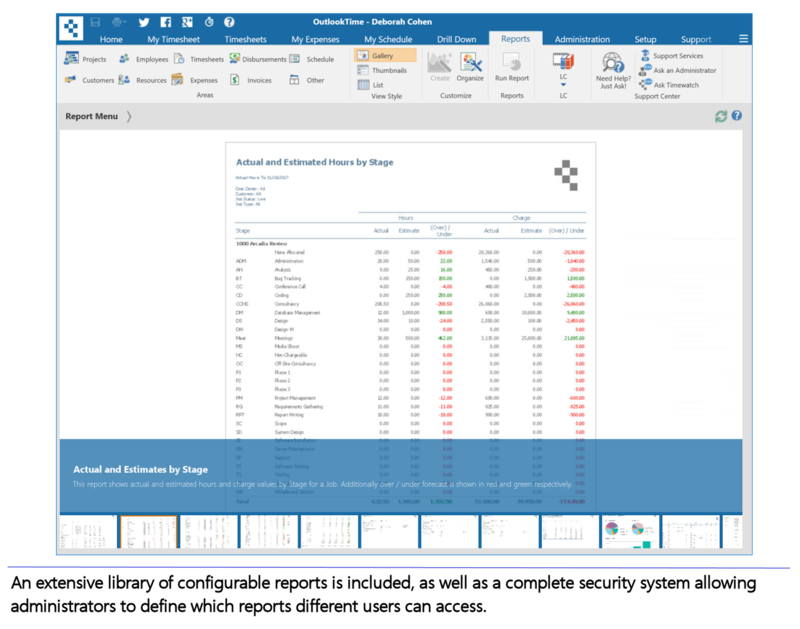 OutlookTime® was designed to look and feel like Outlook. Customers tell us that users feel instantly at home, like they’ve been using OutlookTime® for years. No two organizations are identical, so OutlookTime was designed to be configurable. With 4 editions, configurable options, Apps, and customization options, OutlookTime can perfectly configured to meet your organization’s needs. A range of advanced features are available, including: classic timesheet, manager approval, interactive drill-down reporting, scalability pack, customization pack to tailor your system, report writer and more. Apps allow customers to further enhance and customize their system. Apps cover a myriad of functions, eg: customize terminology, set timesheet rules, add a stopwatch to the timesheet, links with other products such as Quickbooks and Salesforce. We also support custom apps. A sophisticated, configurable solution can be configured to your needs today, and reconfigured as your needs change and evolve in the future. We often replace systems customers have outgrown, something that never happens with OutlookTime as it can grow and adapt as your needs change. OutlookTime is compatible with Outlook for Windows 2016, 2013, 2010 & 2007 linked to Office 365 or Exchange. To be able to scale efficiently, systems need to be designed for scalability from the outset. OutlookTime was, and is scalable from a few users, to several thousand users and supports single-sign-on, a must for large implementations. OutlookTime® starts at less than a couple of cups of coffee per month per person, and it’s more productive and gives a greater return on investment. Flexible, powerful, configurable & scalable, OutlookTime® is the last timesheet system you’ll ever need as it can be configured to perfectly match your requirements today, and in the years to come. Best of all, OutlookTime® saves employees hours each week when compared with traditional timesheet systems making it more cost effective in real terms. Contact us to learn how. OutlookTime® is the available in 4 editions ranging in flexibility, power and complexity. Each is a powerful and configurable timesheet system that integrates with Outlook to save employees hours each week entering timesheets. From the cost effective Essentials edition which cost less than a couple of cups of coffee per week per person, to the more powerful Pro, Corporate and Enterprise solutions, there’s something for everyone. Contact us if you’d like to discuss your specific needs. Ideal for small businesses on a budget. For organizations that need a more powerful & configurable solution. Timewatch® solutions are available on-premises and as cloud solutions that start from as little as $10 per month per person depending configuration, size and term. For pricing for your organization, simply let us contact you, or call us to discuss your requirements.